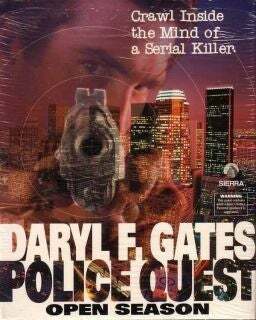 In the mid-1990s Daryl Gates was like the John Madden of law enforcement. His name appeared above PC games made by Sierra. Better known as the Los Angeles police chief during the Rodney King crisis, Gates died Friday at 83. Police Quest: Open Season of 1993 was the fourth game of that series and the first to feature Gates' name on the box. It was also the first set in Los Angeles, instead of the fictional city of Lytton, and for it Gates replaced a former California Highway Patrol officer as the series' designer. Gates' name also ran above Police Quest: SWAT of 1995. Both games were considered disappointments. Under Gates, Police Quest dealt less with law enforcement procedure and more with storyline, and also more mature themes than their predecessors. In the mainstream, Gates was known as the chief of police during the King beatings, which led to harsh criticism and calls for his resignation. He was depicted as out of touch during the April 1992 rioting that followed a not guilty verdict for the officers involved in the assault. Three months later he resigned, moving into other ventures including game consultation and design. Gates is survived by a son, two daughters and a brother.